If you’re on an informal debt solution such as a debt management plan (DMP) or you’re making token payments, your creditors can continue to contact you. It’s likely that they’ll try to get more money from you, hoping that you’ll buckle under the pressure despite what you can afford to pay. Remember that your priority bills and living expenses come before your creditors, so create a budget to work out how much you can pay. It’s important that you stick to the arrangement that you’ve already made, especially if you can’t afford to pay any more. 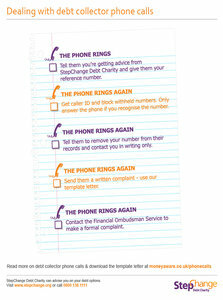 If you’re being harassed by debt collector phone calls, follow our simple 5-step process to help keep them at bay. And if you have to write to them, you can use our handy template letter to help you. Don’t forget that if they need to contact you they will put it in writing, so it’s important to keep your address details up to date. Knowing what your creditors can and can’t do can help to remove a lot of worry and uncertainty but if you’d like more detailed advice on your options use our online debt help tool Debt Remedy.